Crash, bang, wallop! A massive multi-media extravaganza accompanied the public launch of the the Friends of Herne Bay Museum – people, dogs, cameras, sunshine, words on sticks, you name it – total sensory saturation, Herne Bay style. “Herne Bay museum is different from the rest of the museums in the council’s remit. The larger part of the collection is owned by the Historical Records Society who hold it in trust for the town. Unlike Whitstable and Canterbury there was no supporting interest group representing the users of the museum and the residents of the town. “The council received many letters and e-mails in support of the museum, and although the total museum budget has now been cut, the museum remains open while the council engages in a consultation exercise. The group is now encouraging as many people as possible to join up and help play their part in securing the museum’s future. Membership costs £5 per year for individuals, £8 for families and £50 for a life membership. 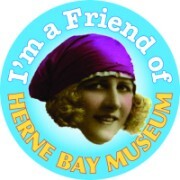 For more information e-mail museumfriends@hernebaymatters.com or write to Membership Secretary, The Friends of Herne Bay Museum, 56 Beacon Hill, Herne Bay CT6 6JN.